He's here. And he's beautiful. Andre Wing Yee Stringer, born on 11/23/12 after 6 hours of induced labor. He's a champion nurser, a phenomenal sleeper, and a smiley charmer. For the last month I've been waiting for the other shoe to drop. For him to scream all night long. For him to stop eating, or perhaps begin vomiting everywhere. But nothing super terrible has happened. He's doing good. We're doing well. He fits in to our family dynamics perfectly - in fact, I can't imagine life without him. In the words of Jean Valjean from the musical Les Miserables, "How was I to know that so much hope was held inside me? ... How was I to know at last that happiness can come so fast?" Suddenly, something wonderful has begun. Our family feels complete. Aww, Congratulations Rebecca. I've enjoyed seeing the pictures you've posted of your little one on Facebook. He looks absolutely precious. 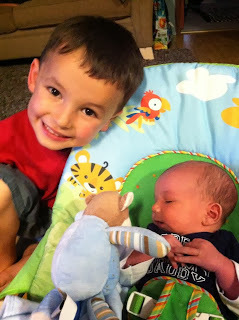 I love Theo's smile...he is such an amazing big brother...beautiful, beautiful boys!